Russian Foreign Minister Sergey Lavrov says Moscow has started delivering S-300 air defense systems to Syria’s government. Russia announced earlier this week that it would supply the anti-aircraft missiles after Syrian forces responding to an Israeli airstrike on Sept. 17 mistakenly shot down a Russian military reconnaissance plane, killing all 15 people on board. The friendly fire incident sparked regional tensions. Israel’s Prime Minister Benjamin Netanyahu called Russian President Vladimir Putin to express sorrow at the loss of life and sent a high-level military delegation to Moscow. A spokesman for a Russian company producing electronic warfare systems says that their deployment to Syria will help protect the country’s air defense assets and fend off enemy air raids. Vladimir Mikheyev of Radioelectronics Technologies said Friday in remarks carried by the Interfax news agency that Krasukha and Zhitel electronic countermeasure units will place Syria’s air defenses under an “electronic umbrella,” making it hard to spot and attack them. Russia announced this week it will provide Syria’s government with long-range S-300 missiles within two weeks. The announcement came after the downing of a Russian plane by Syrian forces responding to an Israeli air strike, a friendly fire incident that stoked regional tensions. Moscow also said it will start using electronic countermeasures to jam any aircraft that would try to launch attacks off Syria’s coast. Syrian opposition activists say al-Qaida-linked fighters have prevented demonstrators from entering a key northwestern town controlled by extremists. Britain-based Syrian Observatory for Human Rights said members of al-Qaida-linked Horas al-Din, Arabic for Guardians of Religion, and other militants prevented the protesters from entering Jisr al-Shughour that has been held by jihadis since 2015. A Syria-based activist said armed insurgents waving black banners marched toward the protesters and forced them to leave. The activist, who spoke on condition of anonymity for fear of reprisals, says the militants consider the pro-democracy protesters heretics. Thousands of people have marched every Friday in recent weeks against a government offensive on Idlib province. The attack was averted last week in a deal reached between Russia and Turkey to set up a demilitarized zone. 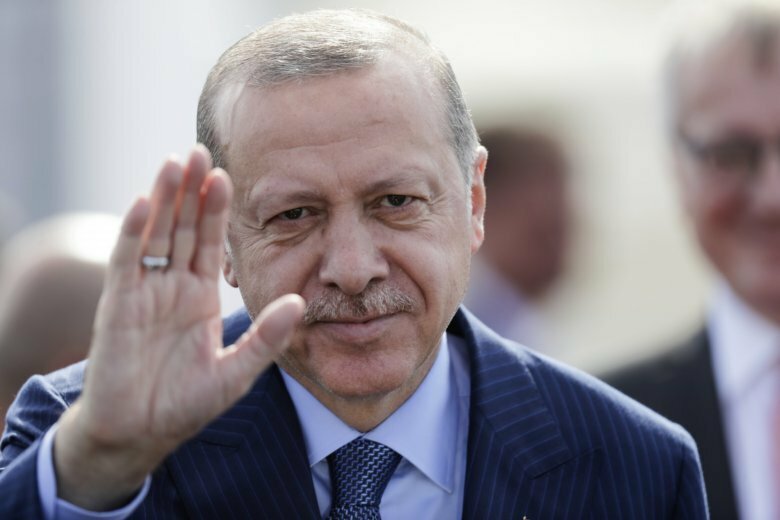 Turkey’s president is accusing the United States of failing to abide by a deal for a U.S.-backed Syrian Kurdish militia to withdraw from a town it had liberated from Islamic State militants in northern Syria. Washington and Ankara struck the deal in June to defuse tensions. It calls for the militia to leave the strategic town of Manbij and for joint Turkish-U.S. patrols there. Ankara considers the Kurdish People’s Protection Units or YPG militia a terror group that’s part of a Kurdish insurgency within Turkey. Turkish President Recep Tayyip Erdogan says the U.S. hasn’t honored the agreed-on “roadmap” for Manbij. His comments were published in Hurriyet newspaper on Friday.